Weewanie Hot Springs Park is a boat access only park in a semi-sheltered bay with a hot spring and bath house for soaking. It is used by recreational and commercial boaters for hot springs soaking, anchorage and camping. Facilities also include a pit toilet, picnic area, campsite and one mooring buoy in the bay. For public safety reasons, hunting is not allowed in this park. Special Feature: A bath house is provided so that park visitors may enjoy soaking in the hot springs water. The hot springs water comes out of the ground on the hillside above the bath house at a flow rate of about 11.8 litres per minute. Water temperature at the source is about 44.7 degrees Celsius and about 38.6 degrees Celsius in the bath house. The hot springs water is not suitable for drinking. Weewanie Hot Springs Park is located on the east side of Devastation Channel, approximately 38 km south of Kitimat. Access is by boat only. Use Marine Chart #3743 (Douglas Channel) and NTS Map Sheet # 103 H/10 (Devastation Channel). The closest communities to this park are: Kitimat and Kitamaat Village. History: Weewanie Hot Springs Park was designated as a park on May 20, 2004 following recommendations from the Kalum Land and Resource Management Plan. The park is within the traditional territory of the Haisla First Nation. The bay was used in the past for logging. Remains of the old log landing site, logging road and an old steam donkey engine can be found on shore at the end of the bay. The bath house building was built in May 1992 by a group of volunteers sponsored by Northern Aquanauts SCUBA Dive Club and donations from businesses in Kitimat. Prior to being designated as a Provincial Park in 2004, Weewanie Hot Springs was a BC Forest Service Recreation Site maintained by the Kalum Forest District out of Terrace. Adventurous and experienced kayakers may enjoy exploring this region. It is possible to SCUBA dive or snorkel in the park. Swimming is possible in the ocean, but the water is cold all season long. There are no lifeguards on duty at provincial parks. Please Conserve Firewood. Campfires are permitted, but firewood is not provided. We encourage visitors to conserve wood and protect the environment by minimizing the use of campfires and using camp stoves instead. Limited burning hours or campfire bans may be implemented. This park has a day use/picnic area. Facilities include a 8 ft. X 15 ft. cement bathhouse for soaking in hot springs water, one pit toilet, one picnic table, one fire ring, one campsite and one mooring buoy. The UTM coordinates for the bath house are: Zone 9U 5949861 m North; 0513888 m East. The UTM coordinates for the campsite are: Zone 9U 5949793 m North; 0513945 m East. This park only has one pit toilet (no flush toilets) which is located about 50 metres uphill from the hot springs bath house. Wilderness, backcountry or walk-in camping is allowed. There is a flat grassy area for camping near the hot springs. Facilities include a 8 ft. X 15 ft. cement bathhouse for soaking in hot springs water, one pit toilet, one picnic table, one fire ring, one campsite and one mooring buoy. Reservations are not accepted at this park and use of the campsite is on a first-come, first-served basis. Outside of the park, about 325 m to the south, there is a trapper’s cabin built by the Haisla First Nation that is available for public use. The cabin is 15’ x 12’ with 2 double bunk beds. The cabin is available on a first-come, first-served basis. Be prepared to sleep outside if the cabin is full. UTM coordinates for the cabin are: Zone 9U 5949258 m North; 0513742 m East. There is Winter Camping in the park. The park is accessible year-round. 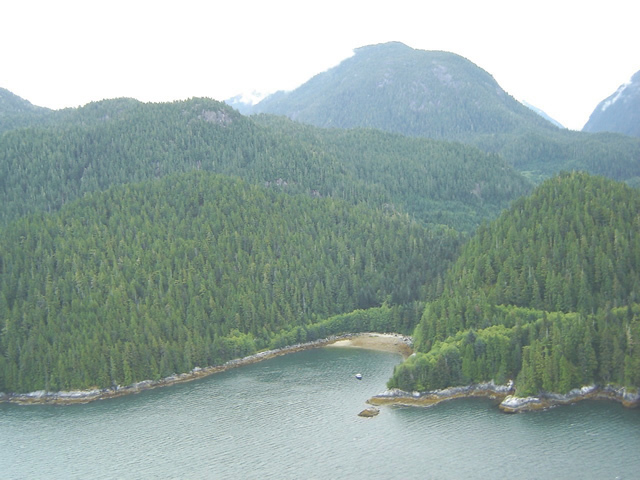 Location: East side of Devastation Channel, in small bay 700 m north of Weewanie Creek, about 40 km south of Kitimat. Facilities: Wood frame and concrete block bathhouse (8’ x 15’) just above high tide line. The concrete block soaking pool inside is about 8’ x 8’ x 3’ deep. Also has change room in bathhouse, mooring buoy, pit toilet and picnic site/campsite with picnic table & fire ring. Comments: The waters are odorless. Short 300 m trail from the bathhouse SE to the picnic site/campsite.